My balance has got a bit slewed to one side lately. Every time I think of something i want to do, I talk myself out of it as its too expensive. I believe that I am getting more insular. Luckily the house is always full of people, well mostly, right now it is actually only me. Plus I see people at work all the time. So I am making a bit more effort. We have a new restaurant/bar just opened up the road from us. Bargain prices so we are going there for a mid afternoon lunch tomorrow, when Fahed gets home from work. We are going to make more effort to do this once every week or two. Nothing too fancy or expensive but just nice. Tonight we are going out again when he comes home from work. To the Asian supermarket (where else would you spend a Friday night?? 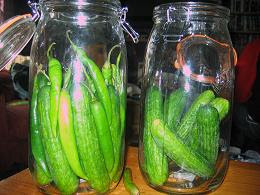 )to stock up on chilies and so forth for a bit of a pickling session tomorrow. I am going to try to visit friends more often, not miss Wednesday evening get togthers with my sister and even try to be more facebooky. I have made myself a plan for the weekend, hopefully that should slow up my natural desire to hibernate!